DANGER! WARNING! IF YOU MAKE THESE YOU MAY CONSUME THEM ALL!!! Consider yourself warned, folks. 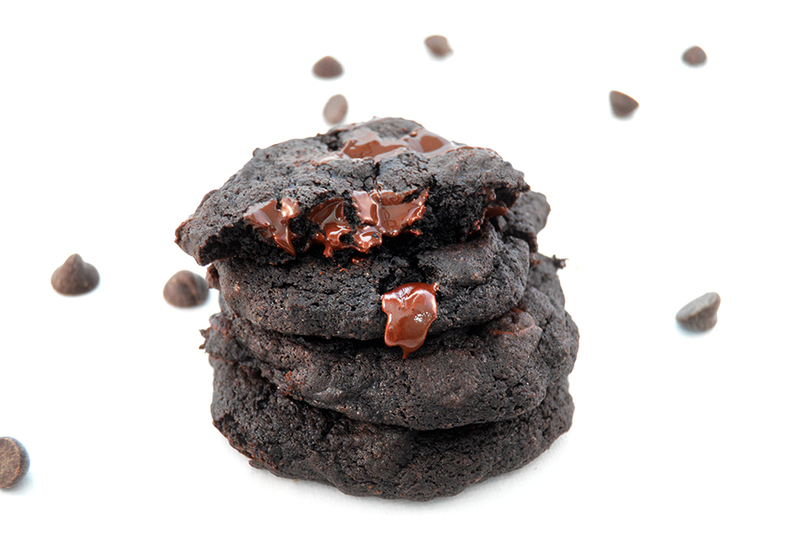 These double chocolate chip cookies are my most asked for recipe, and for good reason. They are basically everything a cookie should be. 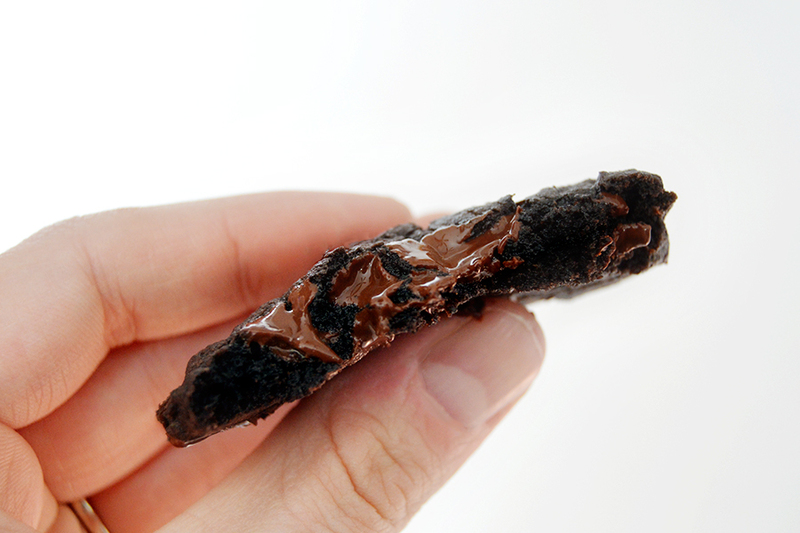 They have a dense, fudgy texture and a rich, chocolaty flavor interspersed with little nuggets of melted semi-sweet goodness. And they’re super simple – like throw everything in the mixer, drop cookie, no refrigeration, comes out perfect every time simple. Pretty much, this is the only cookie recipe you’ll ever need. This is the go-to for me. If someone holds a cookie swap, I’m there holding these babies. If there’s a party, a potluck, or a Friday that needs cookies, I pull out this recipe. If not, here’s the recipe to speak for itself. Below you’ll find all my tips and tricks for making a perfect cookie every time. Beat butter, sugar, eggs, and vanilla until light and fluffy. Add cocoa and thoroughly mix in. Mix in flour, baking soda, and salt. Dough should be thick and sticky. Add chocolate chips. 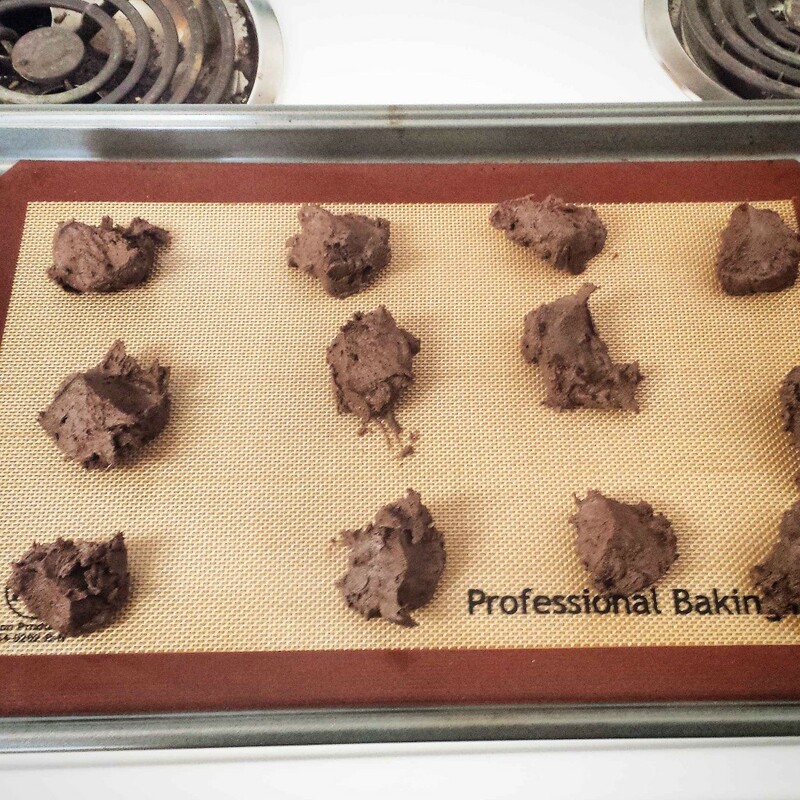 Drop by rounded spoonfuls onto greased cookie sheet and bake at 350° for 8-10 minutes. 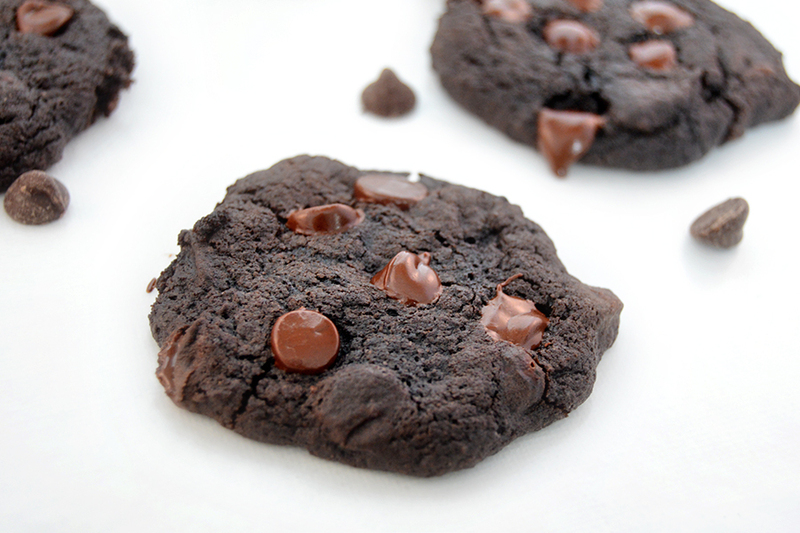 Bring these out when they're slightly underbaked and let them develop on the cookie sheet. This will yield maximum deliciousness! Tips for the perfect cookie – from start to finish! A big secret to getting these (or any other soft cookies) to have a moist texture when baked is to make sure the sugar, eggs, butter, and vanilla are beaten together well. 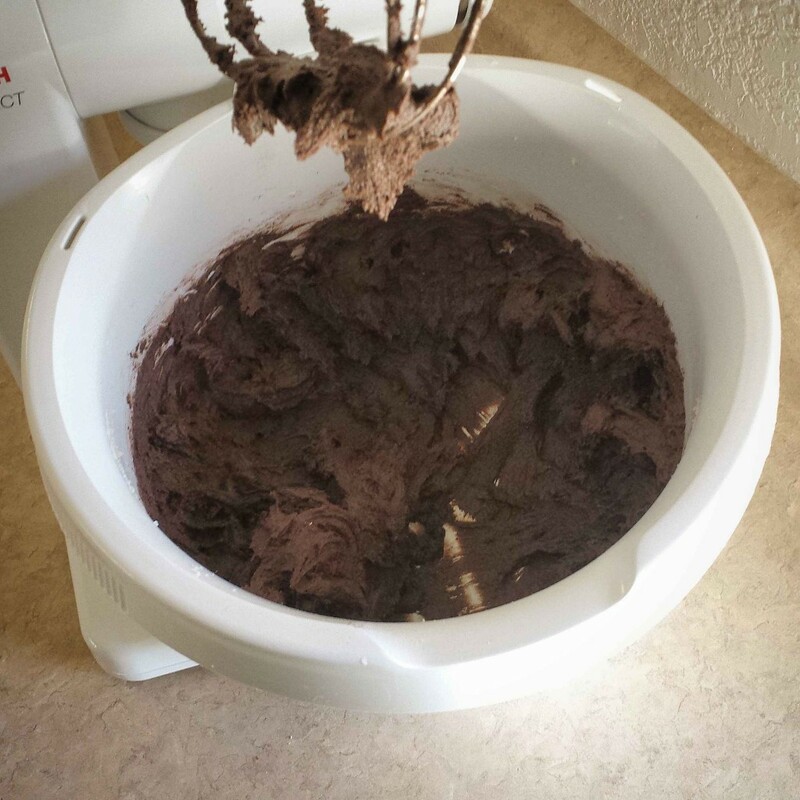 I like to turn the mixer on and let it run for several minutes to make sure that all the ingredients are well mixed. We usually use semi-sweet chocolate chips in these cookies, but we’ve also tried a wide variety of other flavored chips, such as peanut butter, white chocolate, butterscotch, dark chocolate, and mint, along with M&Ms and crushed peppermint bits. All have been a huge hit, so play around. It’s pretty hard to mess these cookies up. Once you’ve added in your chocolate chips, you’ll drop the dough by rounded spoonfuls onto a greased (or silicon) baking pan and bake at 350° for no more than 10 minutes. Most important tip of all time! Do NOT leave these cookies in until they look done! If you do, they will come out hard and crispy.The secret to soft, moist cookies is to take them out when they still look slightly doughy and leave them on the pan on top of the oven for 5-10 minutes. They will continue to cook at the lower temperature and will come out perfectly every time. Have you tried these yet? Leave a comment and let me know how they went! Oh my, these look so gooey and delicious! And like the perfect cookie for a tall glass of milk!! OH my goodness!! those look so decadent and wonderful. i am going to have to make a batch today if i can…and thank you for the tip on the perfect cookie! OMG! I could use these in my life right about now. I am training for a bodybuilding contest and can’t have them but if I could, I definitely would. I love love love fresh baked cookies! Wow – I’m feeling the chocolate overload just looking at the pictures! I will definitely be trying these, maybe for a Valentine’s Day treat for the kids. They are definitely rich; that’s for sure 🙂 I hope you family enjoys them!